Some long-suffering Philadelphia Eagles fans are so desperate to get to Super Bowl XXXIX that they're borrowing against their homes to pay for the tickets. Take Kevin P. O'Donoghue, a lifelong fan from the suburbs, who told his wife after the Eagles advanced to their first Super Bowl in 24 years, "I don't care if we have to mortgage our house, I'm going." So O'Donoghue sunk $4,000 on a Super Bowl package that includes round-trip airfare, a four-night hotel stay and one ticket to the Feb. 6 game against the Patriots in Jacksonville, Fla. To pay for it, he applied for a home equity line of credit, a way of borrowing money that requires you to put up your home as collateral. He's getting the money in a few days. "Sometimes the cards are maxed out and you gotta do what you gotta do," said O'Donoghue, 36, an account executive from Glen Mills. Mortgage bankers in Philadelphia and southern New Jersey say that Eagles fans have been inquiring about refinancing mortgages, or taking out home equity loans or home equity credit lines, to pay for what O'Donoghue calls "the chance of a lifetime." "Some people don't care if it costs them $100 more a month," said Reeber, of Northern States Funding Group. "But I'll stand by it, if they want it." At a time of rising house values and historically low mortgage rates, bankers say it might make more sense for fans to pull money out of their houses than to pay for tickets with high-interest credit cards. "If I had any equity left in my house, I probably would, too," said Shamia Lewis, 26, who works at Innovative Mortgage Solutions in Center City. She and her husband paid for their $8,686 Super Bowl package the old-fashioned way: by dipping into their bank account. Eagles fans stuck by their team when it stunk up the joint and agonized when the Birds blew three straight chances to go to the Super Bowl. Now that their loyalty has been rewarded, why would they let the prospect of 10 or 20 years' worth of additional house payments faze them? But some bankers are wary. Dave Brekher, president and co-owner of North American Federal Mortgage Co. in blue-collar northeast Philadelphia, said his company has turned down homeowners who wanted to refinance their homes to raise cash for Super Bowl trips. 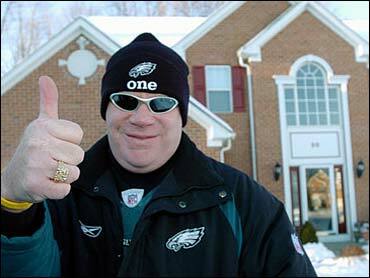 Denny Shestack, owner of Lendco Inc., which approved O'Donoghue's credit line, agrees that Americans have sunk too far into debt - but he doesn't fault Eagles fans for splurging. "I'd argue it's a better investment than a flat screen TV," said Shestack, an Eagles fan who has been to six of the last eight Super Bowls and is going to this one. O'Donoghue, who was 11 the last time his beloved Birds made it to the Super Bowl, promised himself that if they ever made it again, he'd be there - whatever it took. "I can't wait," he said. "It feels like Christmas Eve."